… no guarantee when I'll have another. Some of my latest work was just published on WintellectNOW as a free video. Check it out! This is a short follow up to my NuGet Like A Pro post. I left an additional step out of that post, even though I almost always need to to do it. I didn’t think this next step was widely applicable, and wanted to position the previous post as a “Super Duper Happy Path” that most people could follow with out confusing digressions. However, I did my self a disservice by leaving it out, because now whenever I need to refresh my memory by reading my own post, I am left still having to figure out this one step again. So, I’m going to post it here so that I’ve got all my documentation in one place. If you don’t know what they are, then you probably don’t need to read this post. However, if you are curious they are an artifact created when using Code Contracts. Code Contracts provide a language-agnostic way to express coding assumptions in .NET programs. The contracts take the form of preconditions, postconditions, and object invariants. Contracts act as checked documentation of your external and internal APIs. The contracts are used to improve testing via runtime checking, enable static contract verification, and documentation generation. In other words, Code Contracts are another form of static analysis and client code needs to know about your contracts in order to properly evaluate their own contracts. This is where the contract assembly comes in, it provides the contract information about the assembly in your package. So you need to create this assembly, put it in your nuget package so that the contract checker can find it, and then give nuget a hint indicating that only the “normal” assembly should get a project reference, while the contract assembly (which only contains metadata) should not be referenced by the project. This step is easy, but I will include it for those who are new. First one must visit the Visual Studio Gallery and download the tools. Once the tools are installed, the Visual Studio project properties page will grow a new blade, pictured below. I check almost everything in the “Static Checking” section and leave “Runtime Checking” alone. It would be off topic to explain why in this post, but you can visit the Code Contracts website and make your own decision. You can also choose not to turn anything on, yet still build the Contract Reference Assembly. This will let clients using Contracts know that you don’t have any. By default, the Contract Reference Assembly is not configured to build, but as you can see in the red rectangle, I have turned it on. After rebuilding, you will see that the Contract assembly is now packaged with the normal library. However, if you were to use this package as is, NuGet would add a reference to the Contracts assembly as well as the library. To prevent that, we provide NuGet a white list of assemblies which should be referenced, and it will ignore the rest. To do this, add a child node to metadata called “references” and a “reference” node for the normal library. Now rebuild again, and the NuGet Package Explorer will indicate that the assembly references have been “filtered”. So, to distribute Contract Assemblies (or other any assembly which should not be referenced) follow the steps above. First create the assembly you want to distribute. Next add a file reference to the nuspec which points at the new assembly. Then, add a references node and add references to each assembly which should be referenced (the new assembly should not be in this section, but the original assembly should be). After filtering your references you are ready to go. Upload your package to your favorite feed (nuget.org, myget.org, proget, etc…) and pour yourself a drink. Back in 2012 I posted an article on this blog called “Creating Packages with NuGet the MSBuild Way“. That post described an MSBuild-integrated method to create NuGet packages from your own source code. It has remained one of my most popular posts. Like many popular things on the internet, it has been out of date for sometime now. When I check on my blog and see that the most visited article of the day is “Creating Packages with NuGet the MSBuild Way“, I wonder if visitors know that its out of date. Do they dismiss me as a crank and leave the page immediately? Even worse: do they follow the outdated and complicated recipe described in the post? In 2012, I needed to integrate packaging into MSBuild because I could not find a plug-in for CruiseControl.net that would create NuGet packages. There may be a plug-in now, I don’t know. After a couple years creating NuGet packages, many tools I use from day to day have changed including my source control and continuous integration options. Even though I now have the option to create CI builds on TFS, where NuGetter is available, I still use MSBuild to configure my projects to create packages every time I hit F6. I have a new, simple process for setting this up and it usually takes me about five minutes to convert an existing project to produce a NuGet package as part of it’s build output. I start with some existing code, enable package restore, make one small edit to my project file, and build. That’s all it takes to get the first package in the first five minutes. If I want to continue customizing after creating the first package, I pull the nuspec file out of the existing package, put the nuspec file next to my project file, and customize from there, that’s the second five minutes. Finally, I make some small modifications to the nuget.targets file provided by package restore in order to automate some cleanup, that takes about five more minutes. It takes me about fifteen minutes to get everything setup just how I like it, but if your needs are simple, you can be done in five minutes. Hopefully this simplified process will be much more useful to my future visitors and help you, dear reader, understand how easy it is to create NuGet packages for your open source (or private) packages. So read on for all the details! Any Class Library will do. The important thing is that its something you want to share. Either its your open source project, or a bit of private code which you’d like to share with your customers, other departments in your organization, or just your team. For this example I’ve created a super-cool class called TemporaryFile. TemporaryFile provides a disposable wrapper around a FileInfo which deletes the file when the Dispose method executes. This allows the user to control the lifetime of the temporary file with a using statement, or trust the garbage collector to take care of it during finalization. I find myself creating and deleting temporary files for a certain class of unit tests, and a wrapper like this takes alot of the grunt work out of the task. Notice that the class uses a method from PathUtilities in ApprovalUtilities (part of ApprovalTests). I added this method call solely to generate a dependency on another package, which in turn helps demonstrate how much metadata NuGet can infer for you without explicit configuration. Relying on inference is a big part of keeping this process fast an simple–as long as the inferred information meets your needs. However, the way I used PathUtilities here turned out to be a bug. So don’t copy this code. It is useful to have a bug in the code when doing demos, so I left it in there. If you think the temporary file idea sounds super useful, then a bug free version is now available as part of ApprovalUtilities. If you examine the NugetLikeAPro repository on GitHub, TemporaryFile is a plain old .net # class library. It has a test project but not much else is going on. The NuGet documentation is very good, and covers a lot of ground but if it covered everything then you wouldn’t need me! I think that “Using NuGet without committing packages to source control” contains a lot of good information about what happens when you click the “Enable Package Restore” menu item, but it does not emphasize something very important to us as package creators: the NuGet.Build package installed by package restore contains everything you need to convert a project to create packages. When you enable package restore, two packages are added to your solution: NuGet.CommandLine and NuGet.Build. You could add these yourself, but that would be two steps instead of one. Package restore also performs a third, more tedious step for you: it updates your project files to reference a new MSBuild script and adds a $(SolutionDir) property so that the new script can do its work. The project files need to reference an MSBuild script (NuGet.targets) in order to run the package restore target before the build. The package restore article doesn’t mention that the script also defines a build package target, which can create a package for you after the build completes. So, lets enable package restore on TemoraryFile and see what we get. Just as promised by the documentation, the process added a solution folder and three files: NuGet.targets, NuGet.exe, and NuGet.Config. NuGet.Config is only needed by TFS users so you can probably delete it safely. It has no impact on what we are doing here. By observing red checkmarks in the Solution Explorer we can also see that the process modified TemporaryFile.csproj and TemporaryFile.Tests.csproj. Lets see what changes package restore made to TemporaryFile. If the Enable Package Restore “gesture” is ever removed then we can install the NuGet packages ourselves and make the necessary changes to the project files. This will get tedious and use way more than the five minutes I’ve allotted to the process, so I’m sure someone will think of a clever way to automate it again with yet another NuGet package. However, this is all just my own speculation. Today we live in the Golden Age of NuGet package creation, and package restore does 99% of the work for us. The NuGet.targets file provided by the NuGet.build package provides a “BuildPackage” target. Unlike the “RestorePackages” target, the build package target is not enabled by default. So, we have to edit our project file to turn it on. To edit the file in Visual Studio is a several step process. If I were to make the change from within the IDE, I would: right-click on the TemporaryFile node in Solution Explorer, select “Unload Project”, right click again, select “Edit Project”, edit the project file, save the project file, close the project file, right-click the project again, select “Reload Project”. It’s a hassle. I find it’s easiest to use a regular text editor to make this change rather than Visual Studio. Anything should work, I often use Sublime Text or Notepad++. Plain old notepad or WordPad should work fine. I prefer Sublime because I keep a my “Projects” folder open in Sublime by default so that I can glance at code or edit these types of files quickly. However you choose to do it, you only need to add one property in order to turn on the BuildPackage target. I usually put it right below the RestorePackages property (line 9), but you can choose where it goes. For example, if you wanted to only create packages for debug builds, you could down a few lines to line 12, into the next PropertyGroup, which is only defined when Debug is selected. The same technique would work to restrict package creation to Release builds, if that’s what you would like to do. If you made the change out side Visual Studio, the IDE will notice and ask you if you want to reload the project. You do, so click “Reload” or “Reload All”. Once the BuildPackage property is set to true, MSBuild will execute the corresponding target in NuGet.targets and create a package for you on every build. This package will get most of it’s configuration by inference, and appear in the bin directory next to your normal build outputs. BuildPackage created two packages for me. One is an ordinary NuGet package, which contains the TemporaryFile assembly and one is a “Symbol” package, which includes the same assembly along with additional debugging resources. We didn’t provide NuGet with any configuration information. NuGet configured these packages by convention, and used the project and assembly information to infer what the package configuration should be. By opening the standard package in NuGet Package Explorer we can see what NuGet came up with. The Id, Version, Title, and Copyright are all inferred by examining assembly attributes. These attributes are defined in AssemblyInfo.cs by default. Authors and Owners are both set to “James” which is my user name on the machine where I created the package. NuGet would prefer to use the value from “AssemblyCompany” for these fields, but I haven’t filled it out yet. Since AssemblyCompany was empty, NuGet moved on to the next convention and chose my user name instead. NuGet would also prefer to use “AssemblyDescription” to populate the Description value, but this was also blank. Since there is no other logical place (yet) for NuGet to find a description, the program simply gave up and used the word “Description” instead. NuGet uses the build log to warn me (lines 4, 5, 11, and 12 below) when this happens. 1>  Attempting to build package from 'TemporaryFile.csproj'. 1>  Packing files from 'C:\Users\James\Documents\GitHub\Blogs\NugetLikeAPro\TemporaryFile\bin\Debug'. 1>EXEC : warning : Description was not specified. Using 'Description'. 1>EXEC : warning : Author was not specified. Using 'James'. 1>  Successfully created package 'C:\Users\James\Documents\GitHub\Blogs\NugetLikeAPro\TemporaryFile\bin\Debug\TemporaryFile.1.0.0.0.nupkg'. 1>  Attempting to build symbols package for 'TemporaryFile.csproj'. 1>  Successfully created package 'C:\Users\James\Documents\GitHub\Blogs\NugetLikeAPro\TemporaryFile\bin\Debug\TemporaryFile.1.0.0.0.symbols.nupkg'. Notice on lines 3 and 10 that NuGet noticed that my project depends on another NuGet package. It infers this by detecting the ‘packages.config’ file where NuGet lists the project dependencies, reads that file, and automatically configures TemporaryFile to depend on ApprovalUtilities. Overall NuGet did a pretty good job, and this package is actually usable. Before we move on to customizing this package lets take a look at it’s sibling, the symbol package. The symbol package configuration is identical to the standard package. Version, Id, Authors, and the rest are all the same. However, there are more files in the symbol package. Along with the class library, the lib/net45 folder contains the debugging symbols. There is also a new folder called src. Under the src directory, we can find all the source code for TemporaryFile.dll. All together, this extra content gives Visual Studio enough information to provide a complete step-through debugging experience for this NuGet package. What to do with this package and how to configure Visual Studio to use it are topics better handled on their own, so I wont cover them further here. Stay tuned. There are a few things I would like to change in this package before sharing it with the team/customers/world. I don’t like the default values for Author/Owner and Description. At a minimum the Author field should contain my last name, or perhaps my twitter handle or something I’d like the world to know me by. It is also appropriate to use your company name in this field. The description is important because this package will probably end up in a gallery and certainly be presented in the NuGet Package Manager inside Visual Studio. You need a good concise description so people have an idea what you are trying to share with them. The copyright isn’t claimed by anyone either, be careful here because some default Visual Studio installs automatically use “Microsoft” as the default copy right holder (this seems to have been fixed in 2013, now its just blank). Finally, I don’t like the default 3-dot version number, I prefer the 2-dot version, so I’d like to change that too. These are the low hanging fruit which can be customized using AssemblyInfo.cs. I filled or edited out the attributes which NuGet checks when looking for configuration information: AssemblyDescription, AssemblyCompany. AssemblyCopyright and AssemblyVersion. I also changed AssemblyFileVersion, even though NuGet doesn’t use it, and I left AssemblyTitle alone because I was happy with the value already there. After building again, these changes should show up in the newly created package. NuGet applied most of my changes automatically, and all the build warnings are gone. But I expected a 2-dot version number both in the package name and as part of the metadata. That 3-dot version is still hanging around. I can take greater control over the version number, as well as many other aspects of the package metadata by providing a “nuspec” metadata file. If this file has the same name as my project and is in the same directory as my project, then NuGet will prefer to use the data from the nuspec. You can generate nuspec files from assemblies or project files using NuGet.exe. In the past I’ve found this method for creating nuspec files to be tedious because it creates configuration I don’t always need or configuration with boilerplate text that I need to delete. My old solution was some fairly complex MSBuild scripts that transformed generated files, but today I just create the default package as described above, rip it’s metadata, then customize to my liking. If you have NuGet Package Explorer open, it’s pretty easy to use the “Save Metadata As…” menu item under “File” and save the nuspec file next to your project file (remove the version number from the filename if you do this). Another way to retrieve the package nuspec file is with an unzip tool. NuGet packages are zip files, and tools like 7-zip recognize this, buy you can always change the extension from nupkg to zip, if 7-zip isn’t handy. Once the file has a zip extension, any zip utility can manipulate it, including the native support built into Windows. You can extract all the files from the zip, or just the nuspec file. You will only need the nuspec file. Once you have pulled the nuspec file out of the existing package, move it to the project directory. It should sit in the same folder where the csproj file is (or vbproj, or fsproj) and have the same base name as the csproj. There should be no version number in the nuspec file name, so remove it if there is. You can also add the item to the project using Visual Studio for easy access from the IDE, but it is not required. I usually add it. Now, let’s take a look at what is inside the nuspec file. We can see that most of the information in the nuspec file is the exact information displayed in the package explorer. I can now override the defaults by editing this file. Any XML or text editor will work, it’s very convenient to use Visual Studio if you add the nuspec file to the project, so that’s what I usually do. I changed the version number to “0.0.1” and updated the the author to use my twitter handle. “ACME Co.” is still the owner, and I removed the dependency list. I prefer to allow NuGet to continue to infer this information on it’s own. With these changes, the next package I build should reflect the new version number in the file name, and show updated metadata for Version and Authors. However, the dependency list should remain the same in the completed package. You’ll need some way to share your package now that you’ve created one. If it’s an open source project you can definitely upload it to nuget.org if you like. For private code, that’s probably not a good idea. There are solutions out there, and I wrote about one of them in a previous article: Use ProGet to Host Your Private Packages. In the interest of making sure this article doesn’t get any longer than it already is, I won’t cover options for sharing private packages here. However, there are a couple things you can do now which will make your life easier once you do start sharing your package. First, nuget.targets does not clean up after itself during clean and rebuild. This means that all your old package versions will hang around in the build folder until you delete them manually. Besides taking up space, those packages eventually slow you down when you get ready to share. If you are using the NuGet Package Explorer to share, you have to scroll past an increasingly longer list of old package versions to find the new version you want to upload, and if you use the command line utility, all those old versions increase the amount of typing and tabbing in order to complete the command. Finally, I find the quickest way to push packages is with a custom script which wraps the command line utility, and that script is much easier to write when the bin folder only contains the latest package. To integrate nuget.target with “Clean” and “Rebuild” you need to add a new target to the script, add a new item group which lists the files to clean, and finally ad a hook using the “CleanDependsOn” property that will actually execute the target. Nuget.targets is already added to your solution in the .nuget folder, open it and add what you need. On lines 8-10 I define a collection of items called “OutputPackages” which uses a glob to find all the NuGet packages in the bin directory, referred to in the script as TargetDir. Then I use this item collection with the new target defined on lines 30-32. The CleanPackages target is a very simple target that uses MSBuild’s built-in Delete task to remove the files in the OutptuPackages collection. Finally, I instruct MSBuild to run this target during clean by hooking into the CleanDependsOn property using lines 19-22. CleanDependsOn is one of several hooks provided for modifying targets defined in Microsoft.Common.Targets. On line 20, I add back any existing dependencies and on line 21 I append the CleanPackages target to the end of the list. Now, MSBuild will clean up old packages whenever I Clean or Rebuild my project. Pushing your packages to NuGet.org is pretty simple because it is the default for nuget.exe. Both NuGet.exe and the NuGet Package Explorer will allow you to specify a custom host to push your package to, but I’m paranoid that I will forget to specify the host and send packages to nuget.org that I don’t want to share publicly. So, to speed things up, and to keep the risk of mistakes to a minimum, I use a simple shell script to push my packages. Here is an example that would push to a local ProGet server. I specified ProGet’s default credentials as the API key, but if you plan to push to nuget.org I suggest you use the NuGet “setapikey” option to configure the API key on your machine, and that way you don’t have to commit the key to source control. In this post I showed how to create basic packages with MSBuild, customize them, and gave a couple automation tips I find useful. Once you have converted a few of projects to produce packages this way, you can do the conversion in about 15 minutes for straightforward packages. NuGet packages can become complex and you may need to do a lot more in the customization stage. However, for most cases I find that these few steps are enough: enable package restore, add the BuildPackage property, rip the nuspec file from the first package, customize a few pieces of AssemblyInfo and nuspec metadata, and start sharing your package. Once you have the package, you can quit, or you can make your life a little easier by adding a cleanup target and a push script. Either way, I hope you find this information useful, and bit more approachable than my previous post on this topic. In this post I’m going to explore the benefits of shorter tests. Today, I’m not interested in shortening test run times (although that’s a good thing too). Instead, I am interested in shortening the amount of code I have to read before I can figure out (or remember) the intention of a test. If you believe, even a little bit, that "the tests are the documentation" or "the tests are the spec", then the tests better be crystal clear about what they are trying to prove. If they are not clear then the "specification" aspect of the test will be lost to future readers (possibly yourself). So lets look at one way intention gets less clear when tests are long. While engaged in some practical refactoring at work, I recently came across some really long tests. The general domain was parsing, but I’ve changed the specifics to protect the guilty. I’m pasting the complete test here because I want to give you a taste of how overwhelming the initial test looked. /// Describe a JSON parser. /// Parse this JSON into a POCO object. So the test is not that hard to understand, but the signal-to-noise ratio is wimpy: 2:83. In this high level test, the specifics of the JSON source are not important. The only important thing about the source text is that it produces the expected result. Likewise the only important thing about the expected result is that it is correct and it corresponds to the provided input. So, both giant strings are noise. Of course, the thrust of my argument is that ApprovalTests provides the best set of tools for cleaning up a test like this. But let me setup a couple of straw-men first. What is the improvement? Well now all the code is next to each other, so you no longer have to hunt for the "Act" part, just skip to the bottom, and there it is. Knowing where things should be is one of the strengths of AAA, I’ll concede that. Unfortunately, we haven’t done anything to fix the signal-to-noise ratio, it is still 2:83. It’s a little easier to find the signal, because its all bunched up at the end of the noise (past 2 pages of noise now). To gain any traction on the signal to noise ratio, we need to put the noise somewhere else. Many of testers labor under a misconception similar to this: "A test must not interact with any system except the one under test." Many usually include the file system under the category "any". Clearly, I am not a subscriber to this line of thinking, but I can take a jab at the straw-man by pointing out that the tests exist in code files that live on the file system. So, I would not worry about that, but since so many do, lets see what kind of improvement we can get by moving things around. We could promote the big strings to fields, and reduce the number of lines in our test body. This certainly makes this one test look nicer. If I only consider the test method we have fantastic signal-to-noise: 1:1. This is not to say that it is absolutely clear what this test intends to prove, but we can very quickly see how it tries to prove it. So, good signal-to-noise isn’t everything, but it helps. Can we stop here and call it a day? Of course, the truth is that you can, because the test still passes. Not surprisingly though, I say no. I have problems with this approach. In this example, I’ve only written one test, and this solution seems to work OK, but does it scale? At work, the actual test suite contained many tests, and this solution would not scale well. Applying "move the noise" to all the tests would result in half-a-dozen "sources" and half-a-dozen "answers". These were varying lengths, some much longer than 40 lines, so we are talking about a preamble of many hundred lines of "Arrange" starting off the class before we get to any "Act" or "Assert". I also have a problem with maintaining giant strings inside the tests, no matter where they are put in the code. First, you often run afoul of newlines and quote marks. The newlines in the answer conform to the new lines in your environment, in my case this means CRLF. The JSON blob has a mixture of line endings, so something must be done to the answer or the source to get them to match. Then we have quote marks. The JSON uses double quotes, so I had to convert them to double-double quotes to make the multi-line string literal work. Of course I could have escaped everything and used a normal interpolated string… but that’s work too. I don’t want to do any extra work. Giant strings in the code are also very easy to mess up. If you are clumsy like me (or maybe you are perfect… but you might have someone clumsy on your team) your cursor often ends up where you least expect it when you’re in the middle of typing a tweet to your sweet old grandmother (that’s what twitter is for right?). Next thing your know, your test is failing because some how the phrase "I really liked the pie @Grandma" ends up in your giant string. I don’t like constructing my tests in such a way that debugging sessions can result from dumb mistakes. ApprovalTests for .net is a assertion library that enhances your existing test framework with new capabilities for long strings, dictionaries, collections, log files, web pages, WinForm views, WPF views, Entity Framework queries, event configurations, and RDLC reports. If this is the first you’ve ever heard of ApprovalTests, then I encourage you to explore further by watching a few short videos on youtube, posted by the creator of ApprovalTests, Llewellyn Falco. Don’t let the purple hair put you off, they are great videos. ApprovalTests provide the perfect solution for shortening the long test presented at the beginning of this post. In fact, that test’s original author had essentially re-invented approval testing without knowing it, and without gaining the power that the ApprovalTests library would provide. Our test has three parts, a known input, an action, and a known correct output. The output is the big answer string, and we know it is correct because the test passed when I inherited it from its original author. Approval testing is about capturing human intelligence, a human has declared This is what the DeserializeJson method produces. We should continue to check that the correct answer is given. An approval test automates this check. In particular, the ApprovalTests library not only automates this check for us, but provides us with better feedback on failure. It also hides the noisy strings most of the time, but will present us with an opportunity to review or update the answer when the test fails. After adding ApprovalTests to the project using nuget, I can take advantage of ApprovalUtilities to help me move the big source string into a file that sits next to the code file. I could do this by making a file and using cut and paste, but as I previously discussed, I had to mangle the source with double-double quotes to make the string literal work. I could demangle the source by hand, but letting the computer do it will be quick and less error prone. I changed WriteAllText to ReadAllText, then captured the result in a variable. Next, I updated the call to DeserializeJson to use the text I just read, instead of the string stored in Source. I run the test and it passes. Now my refactoring tool tells me that the Source field is unused. So I delete the giant string and run the test. It passes, leaving me with the same test, minus about 40 lines of string. I could use a similar technique to hide the expectation in a file, but I don’t need to because hiding the expectation is built into the library. This is one of the tasks that ApprovalTests excels at. So, leaving all else the same, I will add a couple namespaces to the code, and make a couple small changes to the test. private const string Expected = @"Announced: False, Created: 1370985561000, Description: ..."
I run this test and it fails, but this failure now occurs after the Assert, when I make the call to Verify. This is expected behavior for ApprovalTests. Until I have approved my expected output, ApprovalTests cannot check it for me, so it must continue to fail until I give my blessing to something. Besides failing, it also gives me the opportunity to review the results by launching a reporter. In this case, the output appears in Visual Studio’s diff viewer because I specified the VisualStudioReporter when I attached the UseReporter attribute to the test method. The output we see on the lefts side is simply the result of converting the instance o into a string. Event happens to have a decent ToString formatting method, but I could have manipulated the output by formatting or redacting the data before calling Verify. Now the only question is whether I should give this result my blessing. Select all the left side and copy/paste to the right side. 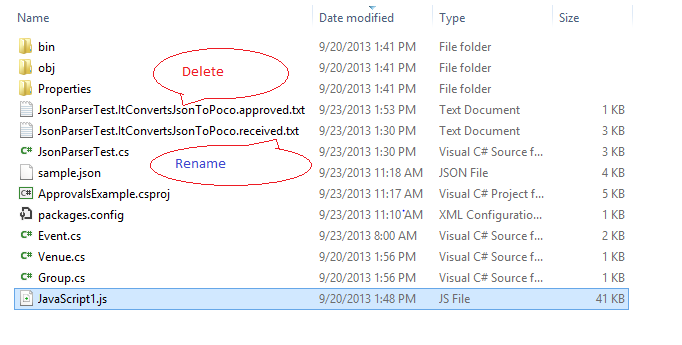 Use file explorer to rename the "received" file to JsonParserTest.ItConvertsJsonToPoco.approved.txt. I will go with option two because I don’t trust copy/paste not to make mischief with things like line-endings and character encoding. After renaming the file, I run the test again and it passes. I should note that I normally choose to use the composite DiffReporter which searches my system for a working diff utility and uses that to show me the results. These utilities (Kdiff3, BeyondCompare, Perforce, and many more…) usually let me approve the result without resorting to renaming files. I don’t know what Microsoft thinks it is accomplishing by hobbling their diff utility in this way. Next, I delete the original assert, re-run the test, and it passes. Now that the original Assert is gone, my refactoring tool tells me that the Expected field (formerly Answer) is unused, so I delete it, and run the test. And I’ve reached my goal. If you still care about signal-to-noise ratio, its 2:3. But more importantly, the entire test, including all the kruft of namespaces, attributes and comments can be seen and understood at a glance. I would probably not spend more than a few seconds reading this test before moving on to read the actual implementation of DeserializeJson. ApprovalTests has allowed me to shorten up this test, which makes the test take up less mental real-estate, and allows me to use more of my brain thinking about the production code instead of the test. The code for this example is available on GitHub. 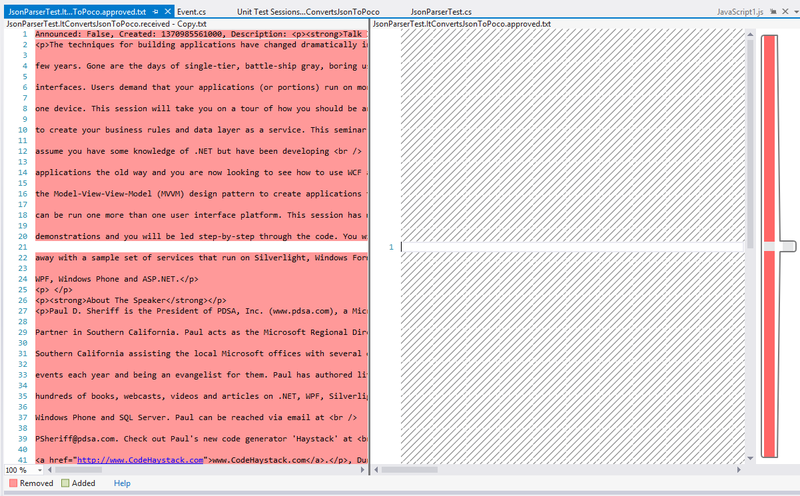 Download the latest version of CompositionTests from nuget.org! Updated the dependency on ApprovalTests to 3.0.01. Thanks to the new version updating policy for ApprovalTests, CompositionTests should remain forward compatible with future versions of ApprovalTests, unless there are breaking changes in the API. Following LLewellyn’s lead with ApprovalTests, I am adopting a JSON.NET-style version update policy. Adopting this policy will enable me to sign CompositionTests in the future without creating forward-compatibility problems for anyone else. For now, the package remains unsigned because its other dependency, the MEFX Diagnostic Library is unsigned. I’ll have to decide if I’m willing to do anything about that before I can consider a signed version of CompositionTests. The impact is that the CompositionTests AssemblyVersion will stay at 2.0.0 from now on. The real version can be found by looking at AssemblyFileVersion, or by looking at the nuget package version, which will be 2.0.1 for this release. The CompositionTests library now declares itself CLS compliant. However, MEFX.Core does not make the same declaration, so certain methods that interact with the core are individually marked non-compliant. I don’t think that MEFX.Core uses anything non-compliant, the library is simply missing the declaration of compliance. I don’t think Microsoft has plans to provide any more updates to this piece, so I’ll have to decide that I’m willing to modify and maintain a fork of MEFX.Core before I can do anything about that missing attribute. Methods and types marked with the ObsoleteAttribute in the 1.0 time-frame have been removed in order to clean up the interface in 2.0. You must now migrate to Verify* and MefComposition if you wish to use new versions of the library. If you missed it, aspConf happened July 17 -18, 2012. I presented a demo of the MVC View testing technique I’ve written about on this blog. My session was July 18 from 1-2:15 PM PST in Room 3. If you missed the live show, I hope you will watch the screencast now posted on channel9. Don’t miss the next aspConf (I presume next year), it’s a virtual, on-line conference and it’s free! You don’t even have to get out of your chair. I enjoy playing with state machines. They are simple enough to implement quickly, and complex enough to give the implementation language a little workout. Followers of this blog will know that I’ve enjoyed using Finite State Machines to explore CoffeeScript. But, when I look at the search terms leading to my blog, I see that people want to see FSMs implemented in C#, C++, or even VB. About the only language I haven’t seen people looking for is CoffeeScript. I’m not too surprised, since most people searching for FSM implementations are probably students trying to cheat get help on their homework. I doubt any professors are accepting CoffeeScript implementations. When I see these search results, I consider quickly posting a solution in the requested language. I don’t mind if students crib solutions from me. I’m a big believer in learning by example. Certainly if by looking at my FSMs I can save one student from writing a switch statement, then I’ll consider it a public service. On the other hand, I’m not really interested in producing solutions by language on demand. Its not so much that I’m worried about students reading my solutions, as much as it is that implanting FSMs over and over again in different languages isn’t very interesting on its own merits. C# also supports closure, so I began to wonder what a C# String.Contains implementation would look like if we wanted to use as much closure as possible. I’ve implemented this machine in C# and C++ before, but I’m intrigued enough by the closure idea to try C# again. This sample should be simple, Visual Studio seems like overkill, so I’m going to code it in Sublime Text 2 and use the C# compiler on the command line. Remember, our goal is to use as much closure as possible, so if we can avoid declaring data properties, we will. All of our data comes in through the constructor, so we can create a lambda expression that closes over the currentState and inputChar and use it as our Match function. We still need to declare the Match function and its signature, but there is no need to create instance properties for the data. For NextState we could define a Func<int>, but that would have no benefit compared to a simple int property, so we’ll use a property. That’s all fine in theory, but does it work? Let’s write a little test in the Main function. As expected, this test prints True followed by False. It’s clear from this test that closure works just as well in constructors as anywhere else. Having satisfied my intuition, I can delete this test code If I want to and move on to implementing the specialized TrapRule and ReturnRule classes. Like the CoffeeScript implementation, I pass currentState to the base implementation twice. However, I can’t pass null for a char value in C#. Instead, I pass in the null character 0. Its also interesting to note that I don’t need to make Match virtual, and I don’t need to override it. All I need to do is make the setter protected so that the subclass can replace the implementation. We can update the test in Main to verify that this subclass works. As expected, we see True printed, followed by False. Next, we can implement the ReturnRule. We actually don’t need to pass currentState and inputChar to the base class, because it only needs to know the nextState. However, it doesn’t hurt to pass it either. Once again, the child class replaces the Match implementation with one appropriate for the return rule. As before, we can update our test to verify the ReturnRule behavior. As expected, this prints False followed by True. In theory, we’ve implemented Rule classes that should work with a String.Contains implementation. We need to see how this works with a machine implementation. In the CoffeeScript implementation, I saw no benefit in converting the createMachine function into a class. In C#, I thought I might be able to do something similar with dynamic. It turns out that this doesn’t work though. The C# compiler produces error CS0828 because you cannot assign a lambda expression to an anonymous type property. I don’t use dynamic very often, so this is news to me. It seems I’m already learning more about C# through this exercise. So, with this restriction in place, I will need to create a class to implement the machine. This implementation compiles, but does it work? We’ll need some test code to determine for sure. To do that we’ll need to implement createSearchMachine and testMachine. These implementations should be possible using Func<> instances in Main without having to create classes. Now we can finally run the machine and see how it works. True--Windows is an operating system installed on many machines. False--Welcome to the operating room, the Doctor is just finishing his martini. Great, Closure All The Things! You can check out the finished code at this gist.